AERFUN Montgolfières- Hot air balloon rides near Paris, Essonne region is also called the "secret garden of Ile-de-France". Aviation Top 100 - Your aviation internet resource. Aviation Top 100, 8000+ indexed & searchable links, Buy & Sell Aircraft, N-number Search etc. Cycle Corner of Frenchtown - full-service bicycle shop with old-world charm serving Frenchtown, Hunterdon County, Bucks County, and the surrounding areas; large fleet of Sport/Comfort bikes for hourly/daily rental; Exotic bikes (Tandem, Recumbent, Child's Bike, & Burley Trailer) also available for rent on a limited basis. 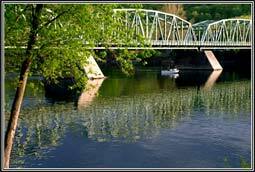 Delaware River Tubing - "Spend a day floating down the Delaware River in a tube, raft, canoe, or kayak. A FREE BBQ meal is included with each rental halfway on the trip at 'The Famous River Hot Dog Man.' Enjoy your lunch next to a beautiful private island with picnic tables in the water. This is a great way to 'Spend a day, not a fortune.' "
Fun New Jersey- What to do and where to go in New Jersey. 100's of day trip ideas in the tri-state area.Find many new and different things to do. 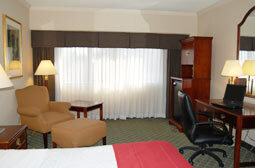 funnj.com - "The #1 source for things to do in New Jersey"
Holiday Inn - Clinton, NJ - In historic Clinton, NJ. An Overnight Romantic Adventure Getaway partner where you will be staying in an Executive Room which boast microwave and refrigerators in the rooms, as well as comfortable seating areas, luxurious bathrobes and more spacious guest quarters. HotAirBallooning.com - Hot air ballooning resource provides information about the sport, including how-to's, event listings, and more. Hot Air Balloon Flights Spain- flights in Spain, Portugal and Mallorca. 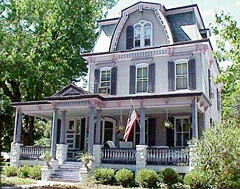 Riverside Victorian Bed and Breakfast - "1882 Mansard Victorian home located in the heart of historic and picturesque Clinton, NJ "
Spain Inn II Restaurant - "The flavors of Spain and Portugal come alive in our cuisine, featuring the very best seafood and beef dishes in the area." State of New Jersey Division of Travel and Tourism - New Jersey’s rich blend of history, unique geography, activities and entertaining opportunities provide residents and tourists alike with something to suit every taste, whim and pleasure. The Spain Inn II Restaurant - "The flavors of Spain and Portugal come alive in our cuisine, featuring the very best seafood and beef dishes in the area." All links are added for your convenience. With some exceptions, by listing these links, we do not endorse nor do we vouch for any of the products any links may try to sell you. If you decide to purchase or sign up for anything, you do so at your own risk.